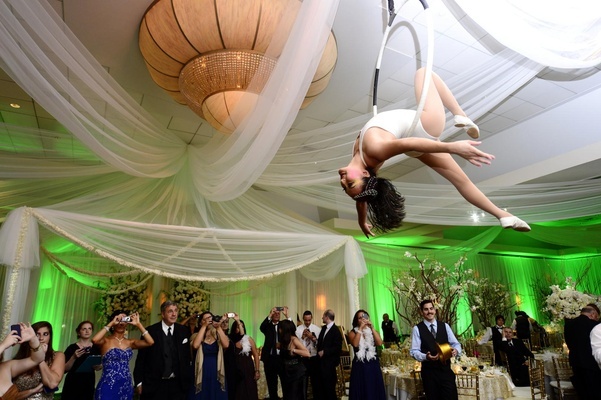 A baby white tiger, mesmerizing acrobats, a crescendo of fireworks – the wedding of Laura Gomez and Christopher Dabdoub was, by all accounts, a grand affair to remember. 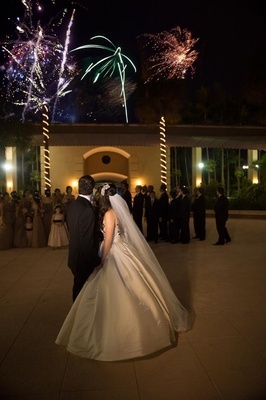 And, one that befit the couple, who both admit to fireworks from their very first meeting. 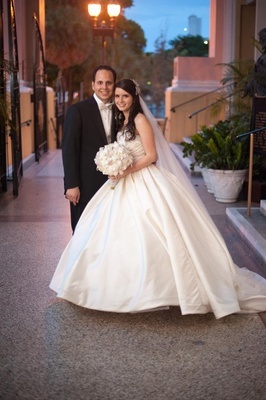 "It was love at first sight," says the bride of their initial encounter in Jamaica. 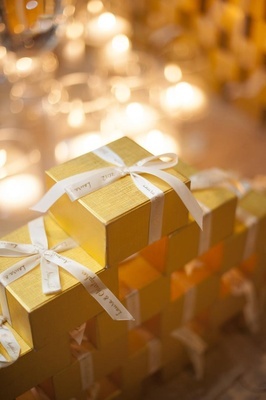 Affirms the groom, "I knew within the first month that I wanted to propose to Laura." In larger-than-life fashion, he did just that. A hot air balloon whisked the couple above the clouds, where Christopher presented Laura with a dazzling ring attached to a leash. After a tearful exclamation of "Yes!" 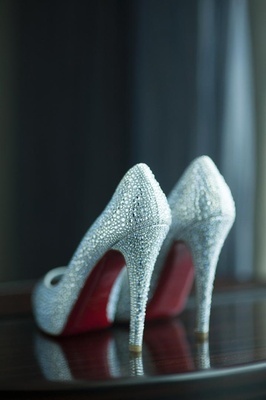 the bride couldn't help but ask, "Why the leash?" Christopher explained that a puppy was waiting for her when they landed. “He told me that he had decided he was going to give me everything that I had always wanted but that he never gave me," shares the bride. Through her tears of happiness, she pointed down at the earth and showed her fiancé the shadow of their hot air balloon, which at that exact moment formed the shape of a heart. 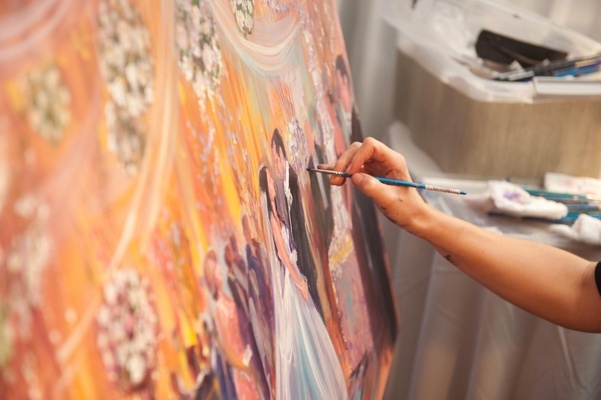 "We kissed and began our journey to becoming a new family," recalls the bride fondly of the moment that propelled wedding planning into action. 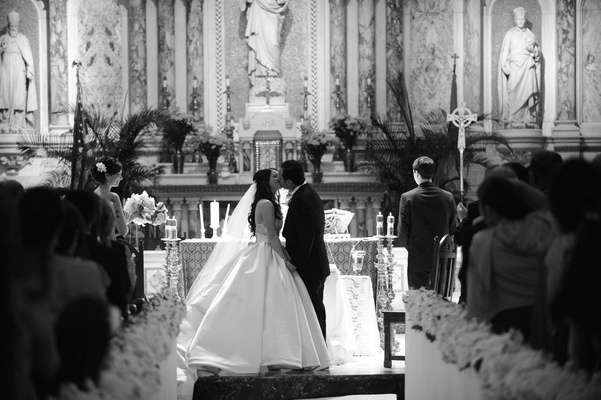 Laura sought a traditional church wedding for their Big Day. "I grew up in a Catholic family where we used to go to mass every Sunday," says Laura, "so it was very important to me." The couple exchanged vows in a beautiful house of worship whose pew edges were lined with snowy arrangements. "We wanted it to look like you were walking in to a fairy tale," says the bride of the decision to line the entire aisle in florals. 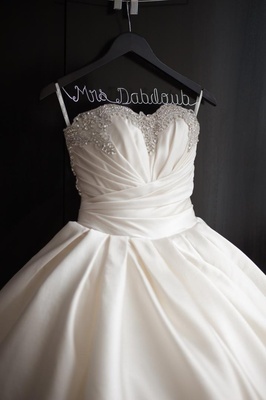 The bride wowed in a vanilla ball gown embellished with a sparkling sweetheart bodice. In her hands she carried a billowing bouquet of alabaster orchids. 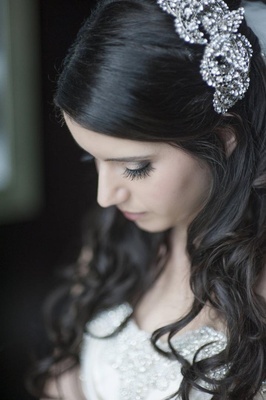 A floor-sweeping veil held in place by sparkling hairpins, along with crystal-emblazoned heels, completed the look. 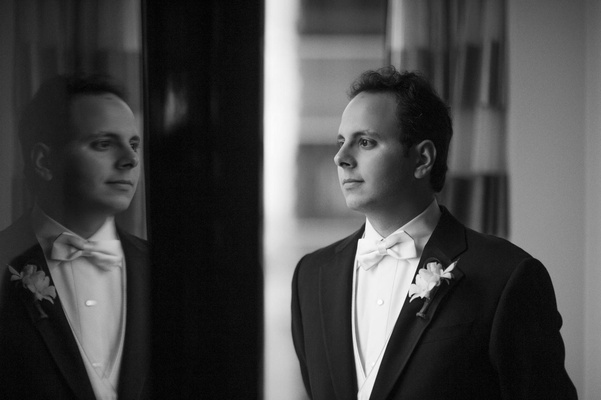 The groom was attired in a black tuxedo paired with a crème brûlée bow tie. 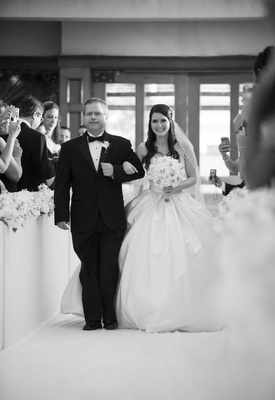 “I had a lot of adrenaline going through my veins,” says the bride of the moment she began to walk down the aisle, “and seeing my husband smiling at the end made me feel like never before." Bridesmaids were clad in strapless champagne gowns with pleated bodices and carried nosegays of peachy roses in their hands. 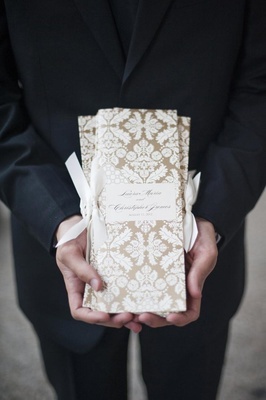 Bronze programs with cream damask designs were tied with vanilla ribbons. 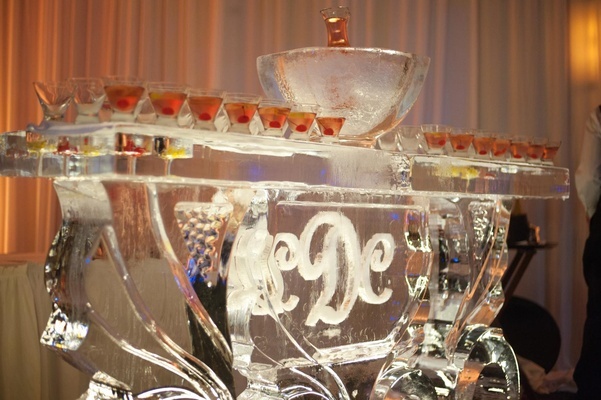 While the bride was intent on a church wedding, the groom desired a large celebration. 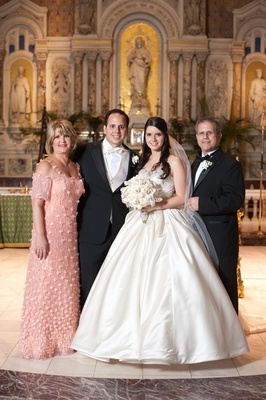 "I love having a big family," he shares of the choice to have more than 550 guests help celebrate their unforgettable day. 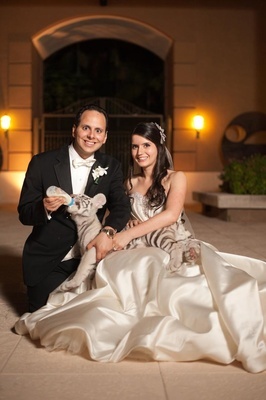 The backdrop for the reception held at a zoological park was a palette of classic, neutral hues: whites, golds, and rich browns. 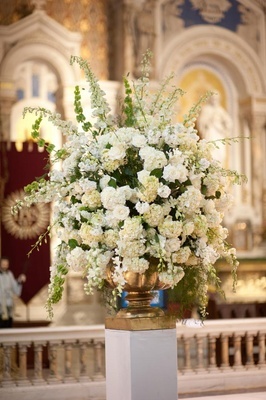 Floral arrangements were fashioned to look like trees with plentiful flowers cascading from sky-reaching intertwining branches. 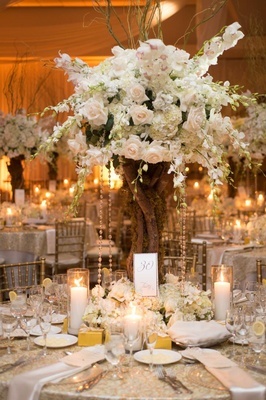 "I wanted to match the arrangements to the venue without losing classic style," explains the bride. 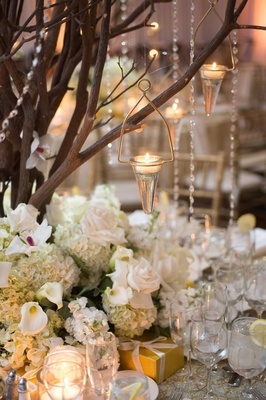 Beaded strands were artfully strewn from centerpieces, while lower snowy flower bunches encircled the base. 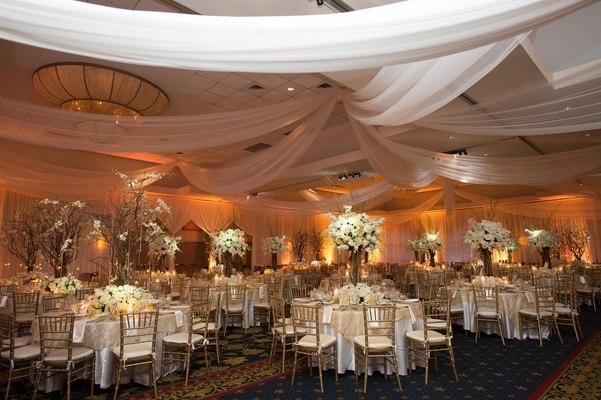 Gossamer fabric was suspended from the ceiling, adding an ethereal touch, as were orbs of creamy florals accented with greenery. 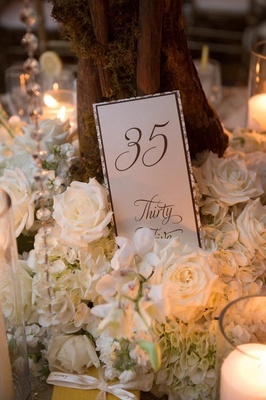 Tables were draped in champagne linens and topped with flickering candles. 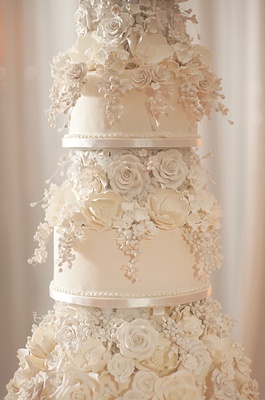 "To be honest," the bride confesses, "I wanted flowers everywhere, so we made sure everything had flowers.” She laughs, “Did you see the cake?" 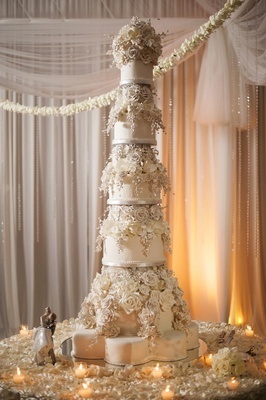 The cake was a towering confection enveloped in endless sugar florals featuring seven tiers, each tier revealing a new flavor. As sweet as the cake was, it was topped by an even sweeter moment: the groom serenading the bride with a song at the piano during the reception. "I broke in pieces while listening to him,” reveals Laura. “It was a very special and intimate moment." 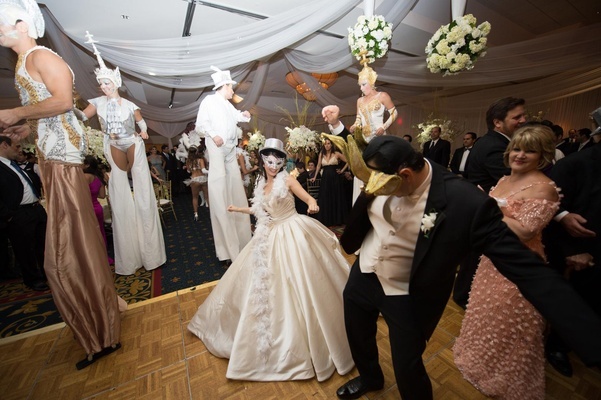 "Everything was magical," says the bride of their lavish day. And there's no hyperbole in her summation. 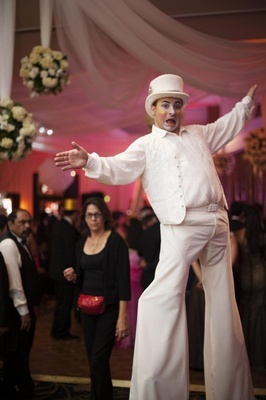 Fireworks, parrots, a cub, a live artist painting, and La Hora Loca, which literally translates to “the crazy hour” in Spanish and features twirling acrobats, stilt walkers, and fantastical revelry meant to keep the party going into the wee hours of the night, truly made for a magical night to remember.